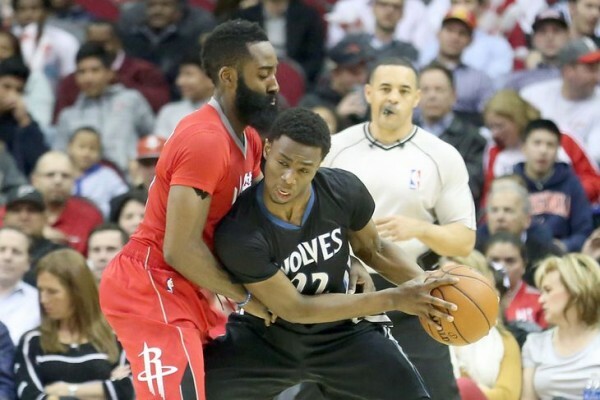 In the discussion about the next MVP, James Harden might be the leading candidate, and his triple double to lead the Houston Rockets in a 113-102 win over the Minnesota Timberwolves showed how strong his case is. On the other side, Andrew Wiggins continues to display just how special he is. Harden notched his second triple double of the season, finishing with 31 points, 11 rebounds, 10 assists and also 4 blocks, erasing the impression of shooting 35% from the field, helped by his impressive 3-point shooting (5-of-11) and his tendency to make up for it from the line, hitting 12-of-15. His best moment probably came in a fancy moment of dribbling, breaking the ankles of Ricky Rubio before pulling up for a 3-pointer and making it. Harden is the first Rockets player since Steve Francis in 2001 with at least two triple doubles in one season but it was a “poor” triple double, the first player with at least 30 points while shooting 35% from the field or worse to get the triple double since Pete Maravich in 1975. Harden started out this season shooting terribly (40.9% from the field in November) but has made up for that in recent months, currently at 45.2% this season. The Minnesota Timberwolves were without the returning lost son Kevin Garnett and mostly looked very bad on offense, shooting 33.3% from the field, including 5-of-18 for Kevin Martin, 6-of-18 for Nikola Pekovic and just 2-of-9 for Ricky Rubio. Andrew Wiggins celebrated his 20th birthday by playing above that paltry level, producing quite a few highlight moments as he soared to score 30 points on 12-of-24 from the field, his best game this month and first 30-point game since January, paving his way for an easy rookie of the year award. The Timberwolves, however, for obvious reasons, aren’t the story here. Franchises from small markets with 12 wins never are. The Rockets, battling in the top of the tight and difficult Western conference, are. Harden needs all the help he can get from his teammates, struggling to find consistency while the lineups keep changing as Kevin McHale, not the most savvy of coaches, tries to find ways and make up for Dwight Howard not playing. This time he started without a center, using both Josh Smith and Joey Dorsey off the bench. The Rockets got 17 points from Smith and 15 from Terrence Jones in a win that ended up being rather comfortable and easy to pad up the stat sheet, but it’s always good to remember who they were playing against, as few teams will play this badly offensively or offer zero resistance on defense quite like the Timberwolves can on most nights.